It’s all about the finishing touches, it’s the accessories that truly make the outfit, and every modern woman needs brilliantly timeless pieces in her jewellery box. 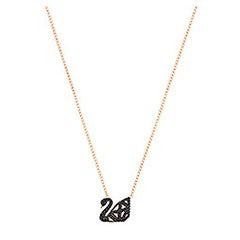 Swarovski continues to showcase its sparkling heritage and says yes to icons this season with its growing collection of strong designs that have become emblematic of the brand and will never go out of style. 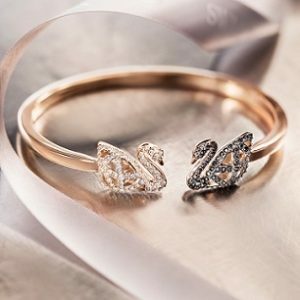 Swarovski’s swan logo takes on a brilliant new form with of-the-moment shapes and silhouettes such as ear jackets and open bangles. 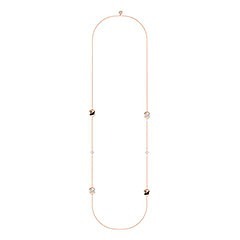 A glittering monochrome palette of jet and clear Swarovski pavé crystal lends classic polish, while the necklace can be worn to show either the clear or jet Swarovski pavé crystal side, depending on the wearer’s mood and outfit. Give classic jewellery a contemporary spin this season. Channel the layered look and stack the simple rose-gold tone open Facet Swan bangle, embellished with Swarovski pavé crystal, along with some of your more playful bracelets. A pair of rose gold tone earrings in your own collection ensures that even on an off-duty day you can feel polished on the jewellery front. 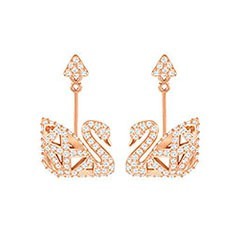 The Facet Swan earrings in clear Swarovski pavé crystal and a rose-gold tone add discreet movement and are instant outfit changers. 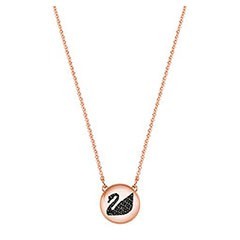 These on-trend accessories can be worn with or without the swan motif and can quickly change from a pair of simple stud earrings to the more statement ear jacket to bring you from day to night. Asymmetry continues to be a key trend this season, so opting to mix and mismatch these earrings has never been chicer.